Long-arm quilting to accent your creative expression. 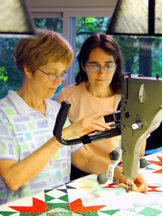 Long-arm computer or hand-guided quilting with personalized service. View samples of our work, read customer testimonials, and search our pattern database at www.aaquilting.com. *If we are unavailable to answer your call personally, PLEASE leave a message and your call will be returned as soon as possible. We started with a building that needed much work and with the help of many we were able to open in the Fall of 1993. We only had a few bolts of fabrics and notions on the store floor.